On Friday, Jan. 25, the 5th Grade participated in a Valentine’s Day-themed service project by making teddy bears for community organizations. 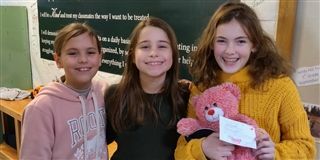 With the valuable help of eighth-grade volunteers, each fifth-grade advisory stuffed teddy bears using a provided kit. Students showcased their trademark creativity by giving the bears adorable names and attaching an original poem describing each bear’s origin story, personality and character traits. The bears will be donated to the Ronald McDonald House, Exceptional Care for Children and the Veteran’s Hospital of Wilmington. We look forward to our next opportunity to reach the community in such a creative, not to mention cuddly, way!